My husband was doing his evening check of the BBC World News yesterday evening, and he stumbled across an article from a week or two ago about how London is setting itself up to be the new global leader in Chinese yuan (remnibi) trading. London has long been the world leader in currency trading, and the fact that several key news outlets are reporting the desire of the city’s financial institutions to wade into the pool of serious yuan trading sends a clear signal about a change in the world money markets. China and other nations have made it known over the past several years that they would like to begin moving away from the US dollar as the major reserve currency. This is not a big secret nor is it breaking news. China is quite keen to throw its hat into the arena, and there are a variety of reasons for that, but the big one is that every time the Fed turns on the printing presses, China, as a large holder of US debt, loses wealth. Let’s face it: no country or business in their right mind wants to run the risk of continually flushing their own wealth down the toilet. It doesn’t make sense. Back before the Iraqi invasion, Saddam Hussein made the decision to sell Iraqi oil in exchange for “petroeuros,” which would have put the dollar out of business in Iraq by making the euro the settlement currency for its oil trade. Shortly thereafter, President Bush declared war on Iraq. We all know how that event went for Saddam, and we all know what Iraq looks like today. It is fair to say that the US government doesn’t take well to other leaders messing with their cash flow. We have a strikingly similar situation going on in Iran today. Why are petrodollars so important? Well, it essentially allows the Fed to continue printing money (monetizing the debt) without that money creation having a drastic effect on prices at home. Why is that? Because foreign countries will buy up that money and use it to trade for oil and gold. China has long been the biggest financier of the US trade deficit by keeping the price of the yuan artificially low, which directly harms Chinese consumers and businesses by subsidizing the US markets. However, China is now making its move to push the yuan to international stardom. For those paying attention, the signs are there. China is attempting to push the yuan to the forefront as a potential replacement for the US dollar. France and other countries have participated in talks with China concerning a move away from the US dollar. That said, a changing of the guard for reserve currencies is not something that will happen overnight. According to an article by Ron Hera entitled “China’s Dragons: Oil, Gold, and the US Dollar,” the removal of the US petrodollar as the settlement currency of choice will big a large nail in the coffin of the US dollar’s dominance in the world markets. Why is that true? Hera uses Paul van Eeden’s Actual Money Supply (AMS) model to show how large the US monetary base (M3 line) has grown since 1971. Assuming a rate of approximately 8% monetary inflation per year with interest compounding yearly, the monetary base has grown by about 1,863% since 1971. However, Hera goes on to point out that the prices of US consumer goods has only risen 533%, which leaves 1,330% hanging out there in the wind. How has this been possible? Petrodollars. Most of those dollars that have been printed by the Fed have been used on the global markets for dollar-based transactions (oil, gold, currency reserves, etc. ), rather than kept at home and allowed to inflate the price of goods in the home market. At this point, the picture is becoming clearer and clearer. Let’s go back to the subject of Iran. Iran is accepting most anything for its oil except US dollars, and China recently signed a deal with Iran that promised expansion of trade, with the provision that those deals not be settled in dollars or euros. In fact, Iran stopped trading its oil for dollars in 2007. China gets about 11% of its oil from Iran, according to CIA data from June 2011. 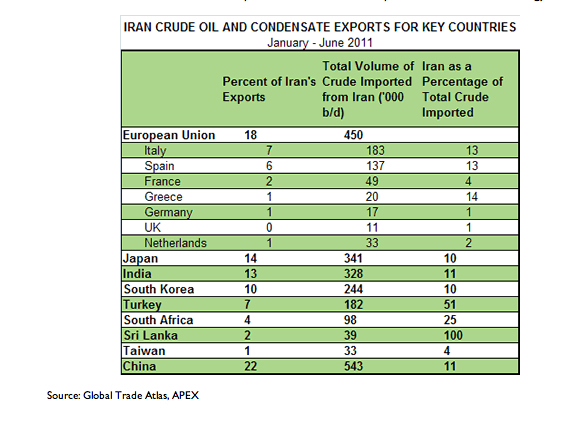 Interestingly, this 11% of China’s oil amounts to 22% of Iran’s oil exports. So why is the US getting belligerent about Iran? Is it because Iran is a threat to US national security with its supposed nuclear weapons? While the government and its media drones would like for the masses to believe that is the case, the reality of the situation leads us down an entirely different avenue. It seems more likely that the US is trying to protect its economic interests, rather than merely maintain a stranglehold on the world’s oil supply. I have long heard so-called intellectuals beating the drum of “no war for oil,” but the reality of the situation is hardly so simple. The US is not going to war for oil: it’s going to war to prevent economic shutdown. The petrodollar is arguably one of the major assets keeping the dollar – and the US economy – above the water. But we must also look at this as an act of aggression against China, in some respects. China is a direct competitor for oil, for China is a mass consumer of oil, second only to the US, and it will need more as production and economy expand. The US is standing directly in China’s way, and although many are neglecting to look at this important perspective, it should not simply be ignored. The battle of currencies and oil is pertinent and of the utmost importance to the national and world economies. While we are fighting a secret cold war with China right now, most hot wars are fought for economic reasons, and I do not believe that it would be out of the question for this to turn warmer as time wears on. The bottom line for the US is this: we must begin to live within our means immediately, and we must work to shrink the money supply. To fail to curtail spending and monetization of debt will be our (silent) undoing. The majority of Americans do not understand this, not because they are stupid, but because they are grossly misinformed by the government and media. We are being made to believe in a terrorist threat that may or may not exist so that the people will approve of these endless wars in the oil-producing nations. If the worst comes to pass, and the public ever discovers the truth, I believe that there will be hell to pay. Please pass along this information. Educate yourself, your family, and your friends about these issues. If we ignore the reality of this situation, we will surely reap exactly that which we have sown. God help us. Please read the article by Ron Hera. I found it compelling and interesting.